Kevin Harvick took the pole for Saturday night’s NASCAR Cup Series race by by edging Denny Hamlin by .006 seconds on Friday. A seven-time winner this season, Harvick covered the .75-mile distance in 22.153 seconds (121.880 mph). 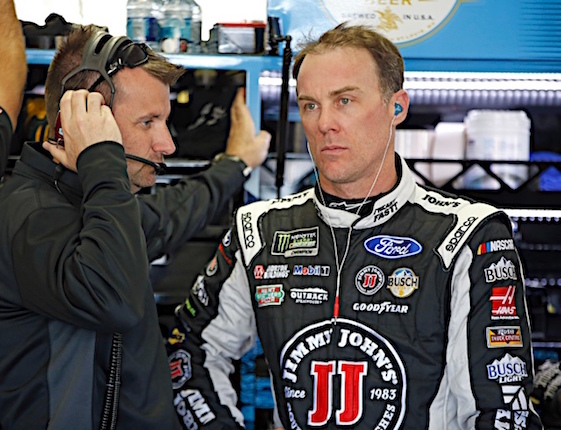 Harvick did not make mock qualifying runs during practice, opting to concentrate on race runs, but his car remained consistent throughout the three rounds. “We didn’t really fall off,” Harvick said. “I think that’s part of the game here. I think we made some good adjustments on making the car better, and for me, just getting more confidence in how fast I could let the car roll and stay in the throttle up off the corner. Hamlin (121.847 mph), whose hopes of advancing to the second round of the NASCAR Playoffs suffered a major blow in a 32nd-place finish last Sunday at Las Vegas Motor Speedway, was surprised by the strength of his qualifying run in the money round. But Hamlin is a three-time winner at Richmond, his home track, and he expects to run well in race trim inSaturday’s Playoff race, the second of Round 1 (7:30 p.m. ET on NBCSN, MRN and SiriusXM NASCAR Radio). Defending series champion Martin Truex Jr. qualified third fastest. (4) Kevin Harvick (P), Ford, 121.880 mph. (11) Denny Hamlin (P), Toyota, 121.847 mph. (78) Martin Truex Jr. (P), Toyota, 121.529 mph. (12) Ryan Blaney (P), Ford, 121.397 mph. (19) Daniel Suárez, Toyota, 121.381 mph. (41) Kurt Busch (P), Ford, 121.256 mph. (10) Aric Almirola (P), Ford, 120.968 mph. (2) Brad Keselowski (P), Ford, 120.849 mph. (20) Erik Jones (P), Toyota, 120.849 mph. (42) Kyle Larson (P), Chevrolet, 120.822 mph. (51) Cole Custer(i), Ford, 120.751 mph. (18) Kyle Busch (P), Toyota, 120.590 mph. (22) Joey Logano (P), Ford, 121.447 mph. (88) Alex Bowman (P), Chevrolet, 121.425 mph. (1) Jamie McMurray, Chevrolet, 121.397 mph. (17) Ricky Stenhouse Jr., Ford, 121.152 mph. (31) Ryan Newman, Chevrolet, 121.093 mph. (6) Matt Kenseth, Ford, 120.979 mph. (9) Chase Elliott (P), Chevrolet, 120.903 mph. (24) William Byron #, Chevrolet, 120.784 mph. (21) Paul Menard, Ford, 120.676 mph. (48) Jimmie Johnson (P), Chevrolet, 120.332 mph. (37) Chris Buescher, Chevrolet, 120.326 mph. (34) Michael McDowell, Ford, 119.058 mph. (14) Clint Bowyer (P), Ford, 121.049 mph. (43) Bubba Wallace #, Chevrolet, 120.946 mph. (38) David Ragan, Ford, 120.935 mph. (3) Austin Dillon (P), Chevrolet, 120.816 mph. (32) Matt DiBenedetto, Ford, 120.778 mph. (47) AJ Allmendinger, Chevrolet, 120.681 mph. (13) Ty Dillon, Chevrolet, 120.498 mph. (15) Ross Chastain(i), Chevrolet, 120.450 mph. (95) Regan Smith, Chevrolet, 120.278 mph. (72) Corey LaJoie, Chevrolet, 119.585 mph. (96) Jeffrey Earnhardt, Toyota, 119.464 mph. (52) Gray Gaulding, Ford, 117.739 mph. (23) Alon Day, Toyota, 117.627 mph. (00) Joey Gase(i), Chevrolet, 117.596 mph. (99) Landon Cassill(i), Chevrolet, 117.055 mph. (66) Timmy Hill(i), Toyota, 116.989 mph.